There’re a lot of complaints typically thrown at musicals. Some people say that the songs are overblown and hokey. Others say that the songs don’t emerge organically out of the action; no one, in real life, just bursts out in song. 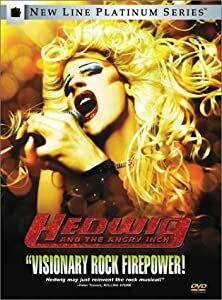 Hedwig and the Angry Inch, however blows both of those complaints out of the water. The songs in the musical are GREAT rock songs — songs that stand alone as well as support the story (sometimes in clever, subtle ways) AND they’re sung in proper contexts that make sense with the action of the story — the film’s about a rock singer, so all of the songs are sung at shows. The odd thing is that on the back of the box, a pull-quote compares it to Rocky Horror, which I don’t get at all. Both are musicals, and both have GLBT issues, though that’s where the comparison ends; Rocky Horror has a kitsch, so-bad-it’s-good (allegedly…) sensibility, where Hedwig has a premise that might make you think the film will be kitschy and jokey… but those thoughts are obliterated as soon as the film gets going. The emotional core of the film is solid and the characters are real. It’s a wonderful, hilarious and tragic film; not necessarily something you’d throw meat loaf at. The main difference is that the film doesn’t require a live audience to “work”. Like Hedwig herself, it doesn’t require a huge audience to bond or perform… but it gets one because it’s earned it — and works the same whether it’s one person watching or a thousand. So, hey, thanks, Janet & Josh! This whole review basically boils down to “Thanks for the awesome xmas gift.” Y’all done good.